Naomi Snieckus & Alastair Forbes To Perform at next GWCI? I’m so stoked to announce that this Saturday’s show features none other than Second City Main Stage alumni: Naomi Snieckus and Alastair Forbes. And if YOU attend, YOU might get to play with them! Naomi Snieckus is an actor, writer, improviser, voice over artist, and director. She studied at University of Waterloo and then Ryerson Theatre School before moving to Vancouver for five years. An alumnus of the world renowned Second City in Toronto she wrote and performed in 5 shows and met her funny man Matt Baram. She is a founding member (along with Matt Baram) of five time Canadian Comedy Award winning The National Theatre of the World and performs and produces: Impromptu Splendor, The Carnegie Hall Show and The Script Tease Project. The National Theatre of The World is a company in residence at The Young Centre For The Performing Arts in Toronto. They have traveled internationally to Berlin, Israel, Amsterdam, England, New York, South Carolina, Chicago, Los Angeles as well as throughout Canada. Naomi won the Canadian Comedy Award for best female improviser in 2010, as well as best female in a TV Series (Mr.D) and was nominated for an Actra Award in 2013 for her work in Mr.D. Alastair Forbes is a Second City Mainstage Alumni, Dora Award nominee and two-time nominee for the Canadian Comedy Awards Best Male Improvisor. You may have seen him on your TV (Insecurity and The Ron James Show, CBC; The Bridge, CTV;Breakout Kings, A&E; That’s so Weird, YTV) on your big screen (My Ex Ex) on your stage near you (Theatre by the Bay, Thousand Islands Playhouse, Centaur) or have seen his voice on your radio (Go!, CBC Radio One). He has written for YTV’s That’s So Weird and is a story editor on a CTV development project Matt and Jeff. Oh, and yes, he’s probably that guy from that commercial you saw. You can catch him almost every week performing at the Comedy Bar or with his critically acclaimed improv troupe Bonspiel! What a splendid evening of comedy last night at The Second City as friends etc. gave their send-offs to main stage cast members Ashley Comeau, Carly Heffernan & Alastair Forbes, all people I got the pleasure of watching during my stint as a host at Second City and who have now become softball buddies & confidants during tough-life-decision-making-moments. I was thrilled to get to see some of the sketches from their previous shows, those I hadn’t got to see because I still lived in Ottawa and/or was too dumb to come see Second City revues. Click & be magically taken away to the NOW Magazine article. I think I forgot to mention the total crazy excitement that happened last Sunday at work. 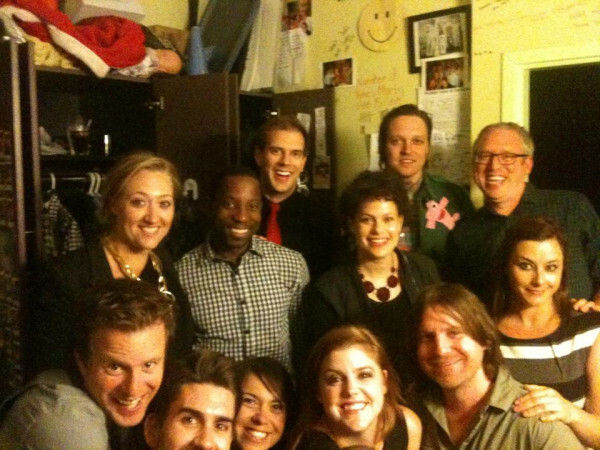 The Arcade freakin’ Fire (Win & Rejine anyway) came to see a show at the Second City. I didn’t get to take a photo of/with them or anything because, I’m a total profesh at my job. Obvi. But the cast got one, so I’m gonna steal it and live vicariously through it. No big deal, but I brought them to their seats and told Win to use the ladies washroom by accident.